Update: On May 11, 2017, the Maryland Public Service Commission awarded offshore wind renewable energy credits to two projects to be built off the coast of Maryland. U.S. Wind, Inc. and Skipjack Offshore Energy, LLC are approved to construct 368 megawatts of capacity, together yielding over $1.8 billion of in-state spending. 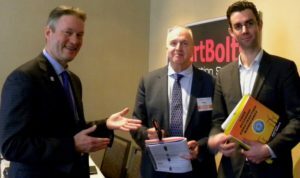 It was exciting for SmartBolts to be part of the ‘buzz’ at the recent International Wind Offshore Partnering Forum (IPF) in Annapolis, Maryland, the #1 technical conference for offshore wind energy in the U.S.
Our CEO, Charles Popenoe with Ross Tyler, Managing Director and host of the IPF and fellow panelist, Chris Willow of BVG Associates. 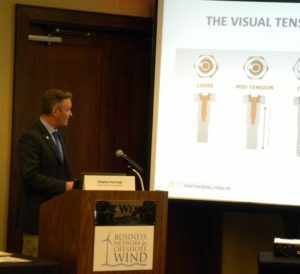 Stress Indicators Incorporated, the manufacturer of SmartBolts, is a member of the Business Network for Offshore Wind, which sponsored the IPF. 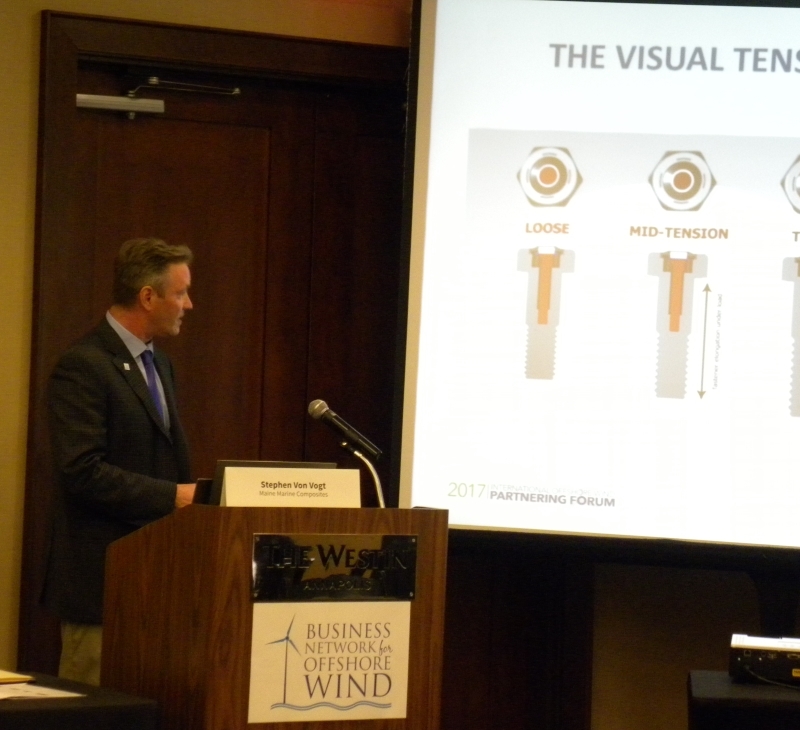 SmartBolts were on exhibit at the conference, and our CEO Charles Popenoe gave a panel presentation representing businesses that are diversifying into offshore wind (OSW). “With offshore wind, we’re introducing ourselves to a new vertical market,” Popenoe said. “Our similar projects have served critical structural applications, such as cranes and amusement rides, which have to withstand significant forces and dynamic loads during operation. But offshore wind is an even more technically demanding application than these examples,” he said. According to Popenoe, a large portion of the attendees at the IPF came from Northern Europe, which has an installed and operational base of over 3,300 wind turbines, compared with only five turbines off the coast of the U.S. “The Europeans have a strong offshore wind business infrastructure and they see the U.S. market as their next target for expansion,” he said. The Maryland offshore wind farm could include as many as 77 wind turbines, and the two competing developers have purchased leases on different plots of ocean off the coast of Maryland near Ocean City, MD. “There’s a lot of momentum, and a lot of optimism about the Maryland offshore wind farm,” Popenoe said. Popenoe talks about Stress Indicators’ track record of 20 years producing SmartBolts. During his IPF presentation, Popenoe talked about Stress Indicators’ track record of 20 years producing SmartBolts and highlighted how SmartBolts allow you to know at a glance that a bolted joint is tight. He also described their use in Agrico shiploader — an example demonstrating the way SmartBolts might be used in the offshore wind industry. “A lot of attendees at IPF immediately saw how SmartBolts could provide benefits to the more than 1,500 bolted joints in offshore wind structures,” Popenoe said. 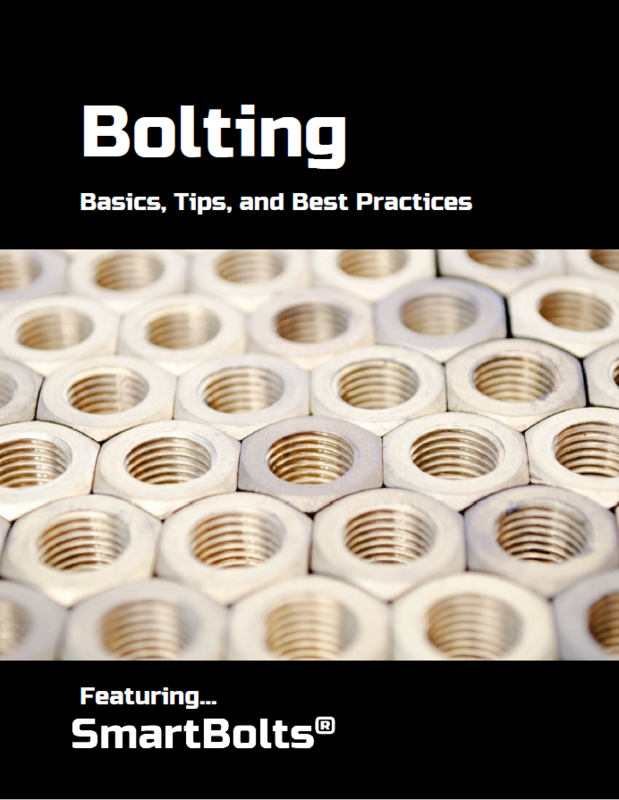 “We learned about bolted connections which require repeated maintenance and torque checks including the base to foundation joints, tower sections joints, blade-to-rotor bolts, internal ladders and structures, as well as electrical bus connections.” These last examples are similar to the busway joints that SmartBolts have been serving for years for customers such as General Electric and Siemens. In just the few days since the conference concluded, SmartBolts have received a substantial response and interest. 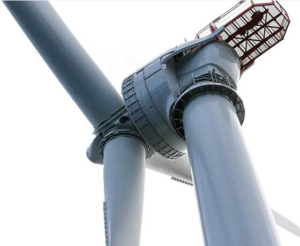 “We’re still in the early stages, but we’re optimistic that we can fill a need for improved bolting technology in wind turbine structures and related equipment, and our goal is to join up with the right partners – companies that would design SmartBolts into their products, or retrofit them into their equipment,” Popenoe said.